How does the most popular silver coin in the world catch the eye of the experienced collector? 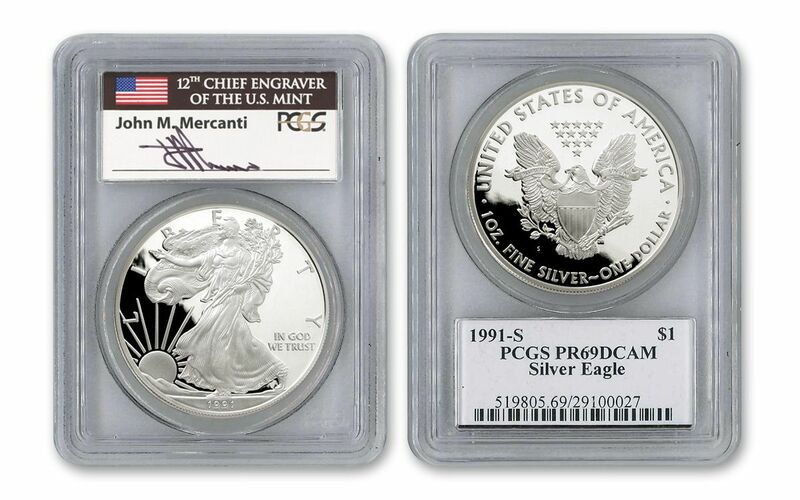 With hand-signed packaging by former Chief Engraver of the U.S. Mint, John Mercanti - available exclusively through GovMint.com. First minted in 1986 at the San Francisco Mint, the Silver Eagle is the only most popular silver coin produced in the United States. And, this 1991 Silver Eagle PR69 Deep Cameo Proof is an extraordinary example of why the coin has become an international sensation. First, the design is iconic. The obverse features "Walking Liberty," an image created by Adolph A. Weinman for the Walking Liberty Half Dollar (1916-1947). In this design, Lady Liberty crosses in front of a large rising sun, with one arm extended and the other carrying olive branches. A bold inscription includes "1991", "LIBERTY" and "IN GOD WE TRUST." The reverse, designed by Mercanti, depicts an eagle with outspread wings behind a shield. Evocative of the Great Seal of the United States, the eagle grasps an olive branch and multiple arrows in its talons. In addition to thirteen stars soaring high above the eagle, the reverse also features the inscription "UNITED STATES OF AMERICA," "1 OZ. 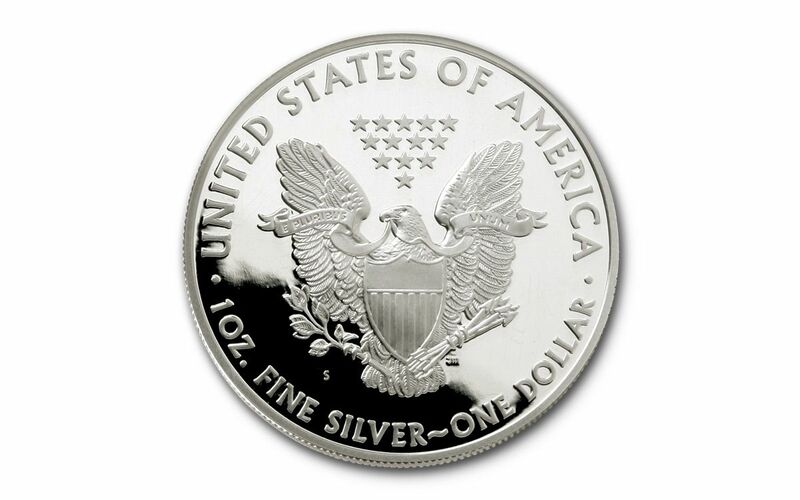 FINE SILVER - ONE DOLLAR," and "E PLURIBUS UNUM." However, you'll enjoy this design all the more because your 1991 Silver Eagle has been given the grade PR69 by the Professional Coin Grading Service (PGCS) - a near-perfect rating that is further enhanced by a Deep Cameo (DCAM) designation. This combination assures you your coin looks virtually the same today as the day it was minted, with a spectacular mirrored background and deep contrast between the surface of the coin and its frosted images. Struck in 1 oz. 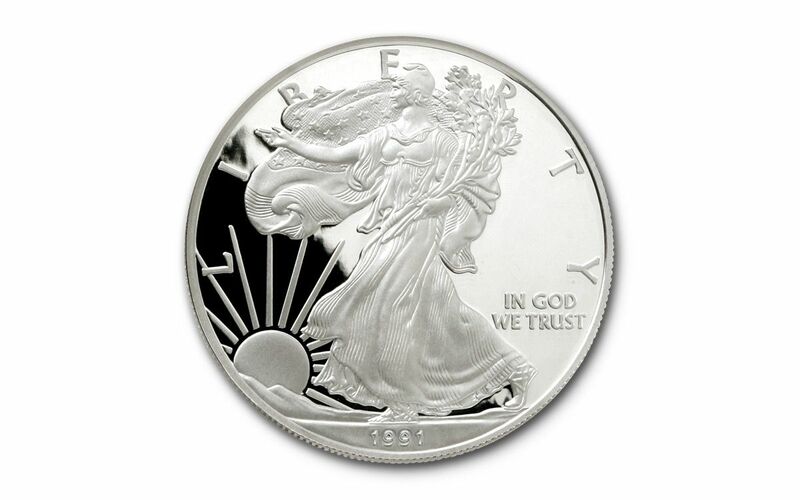 of .999 fine silver, your 1991 Silver Eagle is a proof coin - which were produced in much smaller mintages than their Brilliant Uncirculated counterparts. 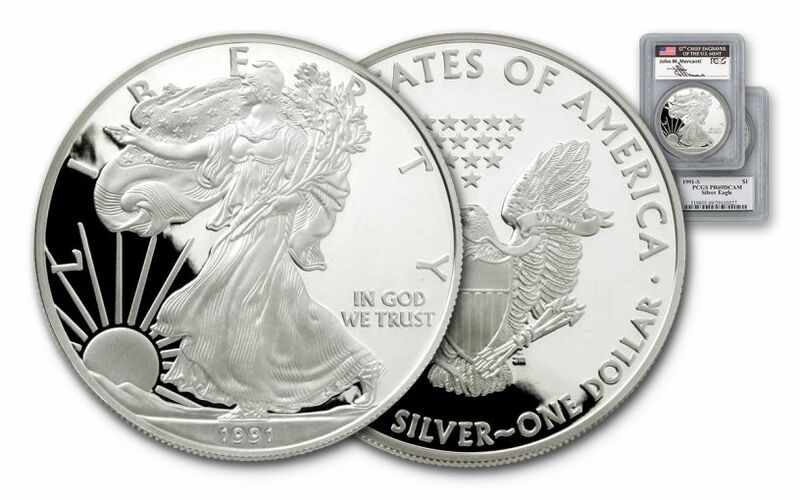 As a result, this coin is a uniquely beautiful offering to complete your silver collection…if you act fast. Quantities are limited, and the 1991 Silver Eagle PR69 coin is one of our top sellers.